As of posting, MCPE on Android devices requires a processor that supports Neon and will crash to a blackscreen if your processor does not support Neon. 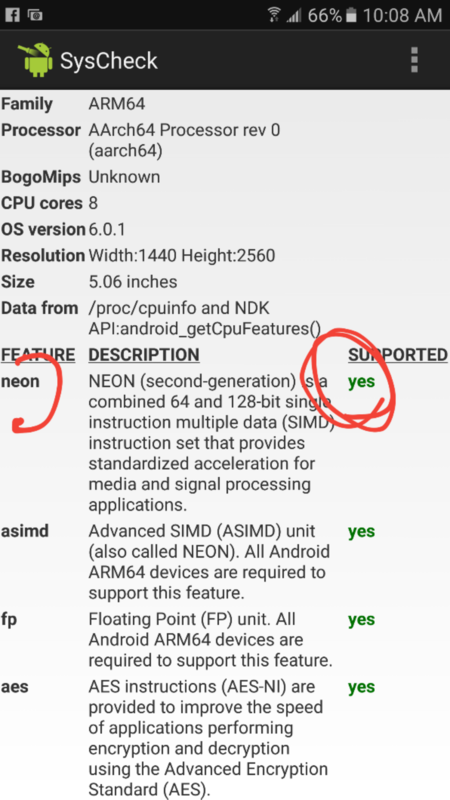 You can check if your device supports Neon by installing a system checking tool and looking at the supported features for your processor. I recommend SysCheck by Christopher Moeller because it is free, simple and because you can see if your processor supports Neon on the very first page, just like in this screenshot (ugly red circling added for emphasis). See this comment for more details. If you are _stil_l getting a Blackscreen crash at start up of MCPE and you have confirmed that your device supports Neon, then please create a new ticket and mention that you've already checked for Neon support. There is just a Blackscreen. There is no way that it starts. Tried to reopen app and just lock/unlock device. Note:The app does not crash, its just a Blackscreen. MCPE-8484 Black screen when launching minecraft! MCPE-9829 Game have a black screen if the game start in spanish! MCPE-10584 Returning to game black screen. MCPE-15381 The screen goes black when launched. MCPE-16644 Bought MPE, it finished downloading and as I go to launch it a black screen comes up as if it we're loading then 2 or 3 seconds later it fails and returns to the home screen. No error report or nothing. MCPE-17184 I tried to enter my MCPE app, 0.15.8 version... Screen went black and never even let me see the main screen. Kicked me out immediately. Same result on ever attempt to get in app. MCPE-18833 Everytime I try to open MCPE on my Android 4.4.2, it keeps crashing! MCPE-18975 It takes minutes to open my MCPE. MCPE-20008 When I try to load my game, it doesn't work. Black screen appears for a few seconds and it just does nothing.